Document Manager is a tool in CTI Navigator Desktop to attach listing documents such as Plat drawings, Disclosure statements, Association Fee statements, and/or Covenants and Restrictions to listings and store these documents on the MLS Internet server (not on your local computer). These attached documents are then available for viewing over the Internet by other agents, or emailing to clients. All documents are stored in PDF format (Portable Document File). PDF files can be read on any computer with a PDF reader (such as the free Adobe Reader in related articles below). This allows linked documents to be displayed on a wide variety computers. Open Document Manager under the Tools menu in CTI Navigator Desktop. (Only users authorized by their broker to add or revise listings or photos will have the Document Manager tool.) On the Select Listing screen, enter (or Browse to) an existing listing number to which a document is to be attached and click the OK button. This brings up the Document Manager screen (see below). Any documents already linked to this listing will display in the Document Manager screen. Highlight a document description and click the View button to display the full document. Click the Delete button to remove the highlighted document (or its Internet link) from the MLS server. To add a document to the selected listing, click Add Document either under File or on the top menu. To add a document to a different listing, click Select Listing and enter (or Browse to) the appropriate listing. In Microsoft Word 2010 and later, use "Save As" and select PDF for the Save As Type. Microsoft Office Word 2007 requires that the "Microsoft Save as PDF or XPS" add-in (see the related article below) be installed to save a document as pdf. Otherwise a PDF converter can be installed on your computer and your Windows applications (word processing and spreadsheets) can then print to the PDF utility to electronically create a PDF document file. Many popular PDF converters are free (such as Cute PDF Writer, Bullzip PDF Printer, or PDF Creator) but some may display advertising either in the document or during the creation process. You also can use free web-based document conversion services that do not need to be installed on your computer (such as www.freePDFconvert.com, http://docuPub.com/pdfConvert, or www.zamzar.com) to convert an existing file to a pdf formatted file. The maximum size for any file that can be associated with a listing is one megabyte (1 MB). If your PDF file is larger than 1 MB, either re-scan parts (or convert them into separate documents) so that their individual file size is less than 1 MB; or scan the pages as images and then use the Create PDF tool in the Document Manager to create linked files as described below. (Otherwise, use a third-party PDF converter with compression options such as http://docuPub.com/pdfConvert, described above). Note: Use Add/Modify Listings (not Document Manager) to link an un-branded Virtual Tour to a listing so that it can be included in MLS reports emailed to the public (see the related article below, "Enter Virtual Tour Link"). Click the Close button to exit the Document Manager and save the listed documents or links. To view documents associated with (linked to) a listing, highlight the listing in a Search Results table and either click the round, blue "Info" button at the top of the table, or the pale gray Documents icon at the top or in the right-column of the table. Then click on the document Name to view it in your Internet browser. To display pdf documents linked to a listing, your computer must have a PDF reader installed (such as the free Adobe Reader listed in related articles below) and must be connected to the Internet (because listing documents reside on the MLS server, not on your computer). To email listing documents, use the "Send" email function in your Internet browser, or the email function in your PDF Reader, while viewing the document. To email from Internet Explorer: click File, then select "Send Page by E-mail" or "Send Link by e-mail." To send multiple documents, use Send Link to create a link to each document, then copy and paste all the links into one email message. You may need to click and insert a space after each link to activate it in your message. To email from Adobe Reader XI: click on the "Show Adobe Reader Toolbar" icon, then the envelope icon in the toolbar added at the top. Select either "Send Link" button, or select "Send Copy" button as desired. On the Send Email screen select to send either using the "Default email application", or "Use Webmail". Use the down arrow to select or add an existing webmail account. To send a large file you can select "Use Adobe Send". Adobe Send requires an annual subscription. To email form Adobe Reader DC: click on the envelope icon at the top, select "Attach to email", then select to Send Using either "Default email application" or "Use Webmail (selected below)". Warning: all such copied and shared links will become invalid (and no longer work) once the original listing on which their reference code was created is purged from the MLS (i.e., after the original listing has expired, sold or been withdrawn, and the date passes the retention period for off-market listings set by the MLS). Note: If you copy the URL for an existing document into the Internet Links in Add/Modify Listings (rather than into the Document Manager Internet URL) of another listing, the Description for the Internet Link will appear under the Web Link column, not under the Docs column, in a data table; and on the Info screen it will appear under the Links heading rather than under the Documents heading. Select Listing - Select the listing to upload documents for. Add Document - Attach an existing PDF document. This allows you to select a previously created PDF document to upload. Create a document from scanned images - This opens the Create PDF tool (See Create PDF in the related articles below) that allows you to create a PDF document from scanned images. Example: Scan the pages for a disclosure statement. Then use the Create PDF tool to import the scanned pages and upload the document attached to the selected listing. Enter an Internet URL - Creates an Internet link to a document/web page that already exists on the Internet. This can also be used to add web links (such as your web page) to a listing. 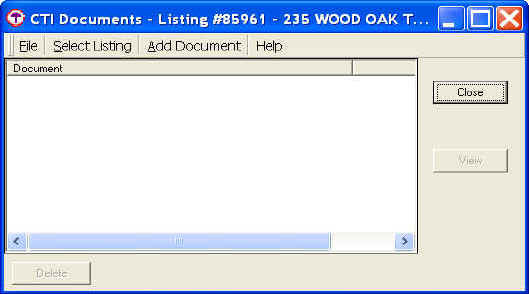 Document window - Displays information about existing documents that have been uploaded for a listing. Delete - Deletes from the system the currently selected document in the document window. View - Displays the currently selected document in the document window. Display Name - When adding a document, you will be required to enter a display name. Enter brief descriptive text (such as Disclosure) that will display as the link in the Web Links window for this document.